• Making our infrastructure more efficient by repairing roads, bridges, water systems…. We see full employment as a means of removing a principal barrier to mitigating climate change: the fear of unemployment—a problem that affects millions of people, in both good and bad times. 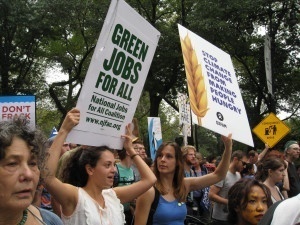 Naomi Klein has written that a guaranteed income would make it easier for workers to say no to dirty energy jobs; I think a guarantee of living-wage jobs would be a better way, particularly in view of the vast need for services and the herculean job of greening the economy or greatly reducing the burning of fossil fuels. Saying no, of course, would depend on the level of compensation. We have a chronic severe shortage of jobs, even now in so-called recovery, almost 40 million people severely disadvantaged in the labor market. It is Important to look way beyond the official unemployment rate which is a politically motivated undercount that trivializes the problem and is a deterrent to building a full employment movement. Counting those who are not actively looking for a job but who want work and those who want full-time work but are forced to work part-time the number is more than doubled and the rate goes from 5.3% in April 2015 to 13.1% of the labor force. We don’t have good data on ghetto unemployment generally and should have it for planning and targeting job creation. We do know that unemployment is rampant in Sandtown-Winchester/Harlem Park where the Baltimore riot erupted. According to a report of the Justice Policy Institute over half of the residents between 16 and 64 have been jobless in recent years. Direct job creation by government is the most efficient and effective way to end unemployment and the myriad ills it causes. And it can be done with green jobs. It costs less for government to hire workers to meet pressing needs for infrastructure repair, human services and environmental protection than to contract out such work or to stimulate the economy through tax cuts. Unlike an overall stimulus, direct job creation can be targeted to the areas of highest unemployment and greatest need—like the nation’s ghettos. The direct job-creation solution, as you know, was pioneered by President Franklin Roosevelt’s New Deal work programs that not only brought jobs and paychecks to millions of unemployed workers but employed them to improve the nation’s physical, cultural, and natural resources. Unemployed workers built or repaired one million miles of roads and 200,000 public facilities, created works of art, wrote and produced plays, served school lunches to over a billion needy children, gave immunizations, taught illiterate men and women how to read and write, and did much more. The Great Depression was a time of national ecological as well as economic crisis—a dust bowl disaster along with depletion of soil, forests, and wildlife. The direct job creation program that employed young men in a Civilian Conservation Corps did much to restore the nation’s environmental resources–soil conservation, more trees planted than in the whole prior history of the country, wildlife protection,…. The CCC, employing many impoverished young workers, was among the most popular New Deal programs al. Some of those given government conservation work became ecologists and environmental activists. Job creation projects today should include innovative projects to mitigate an even greater environmental crisis, one that is global, not just national. Rep. Marcy Kaptur (D-OH) has just introduced a 21st Century Civilian Conservation Act to combat unemployment and help preserve the environment. Not in this Congress but perhaps in the next we might hope to enact such a bill—if so, it would give people an idea of what we mean by direct job creation and what it can do to improve the environment and mitigate climate change—as well as provide jobs for unemployed workers. Most comprehensive among the job creation bills pending in Congress is the Humphrey-Hawkins Full Employment and Training Act, H.R. 1000. Introduced by Rep. John Conyers (D-MI), H.R. 1000 commits the U.S. to assure useful work at living wages for all. H.R. 1000 would create millions of jobs in construction, infrastructure repair, energy and conservation, education, health care, human services, and neighborhood renovation. HR 1000 would be funded by a Financial Transactions Tax of 1/4 of 1 percent on stock and bond transactions and similar small taxes on futures, options, and swaps. In view of who would benefit and who would pay for this legislation, passage of H.R. 1000 would begin a major assault on economic inequality. Two other job creation bills are important to recognize. HR 2553 – National Infrastructure Bank Act attracted the most co-sponsors of any of these bills in the previous Congress. Introduced by Rep. Rosa DeLauro (D-CT) the National Infrastructure Bank Act, with 103 cosponsors, in the previous Congress and will reintroduce it in the current 114th Congress. The Act would create a public bank to leverage private and public capital to support infrastructure projects, including transportation, environment, energy, telecommunications, and water projects. The bank would emphasize environmental infrastructure projects such as clean water, energy, and electric infrastructure projects. HR 2553 is supported by the Blue-Green Alliance, the United Steelworkers, and Utility Workers of America. HR 1617 – Emergency Jobs to Restore the American Dream Act. Rep. Jan Schakowsky (D-IL) has introduced HR 1617, which would create over 2 million jobs over two years: public service jobs to implement energy audit programs and retrofits, improve public parks, renovate schools and housing, and expand childcare and early education. HR 1617 would be financed by higher tax brackets for the rich, eliminating Big Oil subsidies, and closing tax loopholes for corporations that ship jobs overseas. These bills will certainly not pass in this Congress, but pending legislation such as these give a certain reality to direct job creation. NJFAC would like to organize meetings in areas throughout the country that feature local officials and Congressional sponsors and co-sponsors of job creation. These would lay out the extent of the jobs deficit, the effects on communities. The extent of unemployment in the neighborhoods of the poor, especially the black poor.